1982 bay Hackney Pony Stallion. Many times Champion show horse, Region 8 championship show Champion resin pony. Fantastic action and attitude, and excellent bloodlines! Bred by Double Hart Ranch. 1991 dark bay Hackney Pony mare. Currently unshown, nice bloodlines including Knight Appeal and Cadetsons Choice. Bred by Shanachie Stables. 1993 dark Bay Hackney Pony Mare. Unshown, excellent bloodlines! Bred by Double Hart Ranch. 2000 chestnut sabino Hackney Pony mare. Unshown, great bloodlines! Bred by Double Hart Ranch. 1995 palomino paint pony mare. Unshown, primarily model bred pedigree. Bred by Persimmon Hill. 1997 chestnut tobiano Paint Pony mare. 2015 MIJC National Champion, multi champion in regular shows. Excellent pedigree, mostly modelbred. Bred by Cory hartung/Double Hart Ranch. 1999 grulla tobiano Paint Pony Mare. Paint/shetland/QH breeding. Champion halter pony, bloodlines to Hollywood Dun It, One Tuff Wiz Kid and Hidden Acres Pinto Coneso. Bred by Cory Hartung/double Hart Ranch. 2000 smutty buckskin tobiano Paint Pony mare. LSW, unshown in photo shows. Blended pedigree of Paint, Morgan and Riding Pony/Welsh lines. Bred by Lickety Split Acres. 2000 Grulla tobiano Paint Pony Mare. 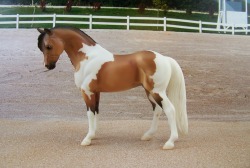 Excellent show mare, Paint/Shetland/QH Breeding. Bloodlines to Hollywood Dun It and One Tuff Wiz Kid. Bred by Cory Hartung/Double Hart Ranch. 2003 bay tobiano Paint Pony Mare. Champion show mare, bloodlines tracing to Sockett, Master Gallant Wiz and Jordache. Bred by Kay Myers/Caballos Del Mar. Performance Champion. Region 8 Champion Pony. Sire of Live Show Performance champion Cody's Angel O/B Suzanne Feld. Excellent lines tracing to Poco Bueno and Mr. Bar None. 1989 dark bay QUARTER PONY mare. Multiple times NAN qualified show mare! Excellent lines including Sonny Go Lucky. Dam of a Live show champion mare. 1996 bay Quarter Pony Mare. Unshown, excellent QH and Welsh lines tracing to Zan Parr Jack, Doc’s Hickory, Rugged Lark and Solway Master Bronze. Bred by Hidden Valley. 2001 dun Quarter Pony mare. LSP, great bloodlines tracing to Sir Quincy Bob, Sonny Deluxe and Boston Mac. Bred by Ber Ali Farm. 1999 chestnut blanket stallion. Live show winner, champion halter horse. Bloodlines mostly Appaloosa and Connemara and tracing to Mighty Paul, and Santee Cadet. Bred by Cory Hartung/Double Hart Ranch. 2010 chestnut semi leopard stallion. Excellent halter pony, blend of model and real bloodlines. 1988 bay blanket POA Mare. Unshown, nice lines. 1988 chestnut leopard POA Mare. Limited showing, good placings. Excellent model bred pedigree. Bred by Thunder Glen. 1999 bay semi leopard POA Mare. Limited showing with good results. Bloodlines a blend of real and model. 1994 chestnut Haflinger Stallion. Live Show Champion. 2009 MIJC National champion Lakeshore! Bred by Heidi Reeves. 1988 chestnut Haflinger mare. Shows as "Foxfire Brigitta", "Z" satisfies halflinger naming traditions of being named with first letter of dam's name. Multiple times champion, Grand champion halter mare. Blend of real and model bloodlines. Bred by Kay Myers/Caballos Del Mar. 1995 chestnut Halflinger mare. Unshown, model bred and real pedigree. Lines to Winterstein, Martin, Magler and Midas 2x. Bred by Persimmon Hill. 1998 chestnut HAFLINGER Mare. Unshown, well bred! Lines to Stecher, Sturmer and Hetja. Bred by Dragon Star Stables. 1999 bay tobiano SPOTTED DRAFT PONY stallion. Live show winner. OFCC Nationals Champion, MIJC National Champion! Multiple times halter champion. Sire of multi champion foals. Bred by Me-Dow stables and Halo Ranch. 1989 Palomino tobiano Spotted Draft Pony mare. Unshown. ½ Welsh Cob, ¼ Shire, ¼ Paint breeding. Bloodlines trace to Llanarth Goldcrest, Caradog Llwyd, Ladbrook Invader and Three Bars, Bred by Samantha Kroese/VnV Stables. 1992 black tobiano Spotted Draft Pony Mare. Unshown, Dam of halter champions. Breeding is Clydesdale/Shire/Paint on sire’s side, Welsh Cob on dams. Traces to Ricinus Koncarlet and Parc Welsh Flyer. Bred by Samantha Kroese/VnV Stables. 1994 bay Spotted Draft Pony Mare. Unshown, bloodlines are ½ Welsh cob, ½ Shire, ¼ Paint and traces to Ryefield Select, Mathrafal, and Spotted Bars Hank. Bred by Samantha Kroese/VnV Stables. 1993 Yellow Dun HIGHLAND PONY mare. Live show champion. Excellent bloodlines! Bred by Carra Reinmiller. 1999 bay CHINCOTEAGUE Mare. From the Misty family of chincotegue ponies. 2008 chestnut roan tobiano Sport Pony Stallion. Limited show career. Sire is of Oldenberg/Connemara/welsh B blood. Bred by Randa Garrett/Twin Springs Stables. 1994 buckskin Connemara Stallion. Excellent show pony. Pedigree traces to Aladdin and Hayselden Bacchus. Bred by Cory Hartung/Double Hart Ranch.